Despite popular belief, authentic paella is technically a regional seafood and rice dish from Spain. While many gourmands tend to see paella as a seafood dish that hails from Spain, the dish is actually specific to Valencia. So what makes paella, paella? The base for all true paellas is believe it or not, toasted rice. You will not find true paella without this layer of toasted rice on the bottom. The toasted rice can only form if the paella is cooked on the stove. If the paella is cooked in the oven, the rice will not toast. Therefore, some oven cooked recipes require that you toast the rice over high heat after cooking in the oven. With that said, an authentic Spanish recipe for paella is easier made over the stove. Valencian paella (and to purists, the only real kind of paella there is) is a combination of white rice, beans, snails, green vegetables and seasonings. 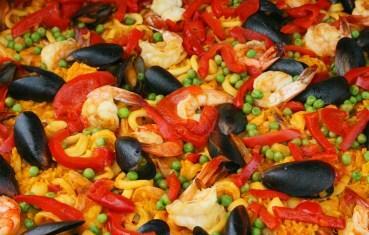 Note that there's no seafood in true paella, even though paella is typically thought of as a seafood dish. Seafood paella is generally what people think of when they think of paella. It is made with seafood and rice. Just as the name implies, mixed paella is made with a mix of seafood, snails, beans, rice, and vegetables. Generally, true Valencian paella never mixes seafood with snails. However, mixed paella is what most people expect when they think of paella. This is a simple mixed paella recipe. The recipe does call for you to transfer everything to a paella pan. If you don't have a paella pan, you can use a large Dutch oven, or a large oven safe skillet. Paella is traditionally served with lemon. You'll need to scrub the mussels and clams thoroughly. Discard any that don't close when tapped sharply. (This means that they are not truly fresh.) Set aside in a chilled bowl. Heat 1/4 cup of the oil on medium heat. Add the boneless pork, browning on all sides. Add the garlic, onions, tomatoes and bell peppers. Stir constantly until they are properly cooked. The onions will be translucent and the vegetables will be able to be pierced easily with a fork. Set aside. In a different skillet, heat 1/4 cup of oil and cook the chicken, browning it on all sides. Add to this all the seasonings, including the salt, pepper, paprika, rosemary, thyme, and cumin. Stir and then transfer seasoned chicken to a plate to set aside for later. In the same skillet that you cooked the chicken, cook the lobster claws over high heat, until the shells turn pink. (You'll need to cook them for several minutes.) Set aside. While you're preheating the oven, sauté the rice in a skillet with four tablespoons of olive oil. The rice is done when it's translucent. Once the rice is done, pour in the chicken broth. While stirring constantly, add the pork mixture and sprinkle in the saffron. Continue to stir until the chicken, rice and saffron are well mixed. Transfer the rice into a paella pan. Add to this, the lobster claws, chicken, chorizo sausages, mussels, clams, shrimp, peas, and capers, making sure to combine everything well. Bake the paella on the lowest shelf in the oven until all the liquid has been absorbed, approximately 25 minutes. Make sure to remove any mussels or clams that have failed to open. Garnishing with lemon wedges, serve the paella straight from the pan.